Interview with Ned Vena, in which he talks about painting, gesture and the problems of representation. Ellen Mara De Wachter: Could you describe the processes by which you made the Garvey ink works and the vinyl works? Why did you choose to work with these two unusual materials? Ned Vena: It’s interesting to think about the Garvey inks a year after having made them. A year ago now I was going through a rigorous process of trial and error to see if they would actually work. The Garvey works have a lot to do with drawing. I draw in sketchbooks with heavy markers. Every line drawn on one page leaves a residual trace on the page below, something of a phantom image. This made me question the role of gesture in painting, perhaps the privilege associated with gesture or the unique properties of a gesture. I was interested in an economy of gesture, and excited by the possibility of being able to glean more than one painting through a single process. I work in a realm of reproducibility and to reduce a process of reproduction to something hand painted was interesting to me. The Garvey ink was appealing to me for these works not only because it is an ink, but also because of its vibrant colour. Colour has always been part of my paintings. If a material I am interested in happens to be black, brown or purple, its colour acts not as a choice but simply as an inherent property of that material. 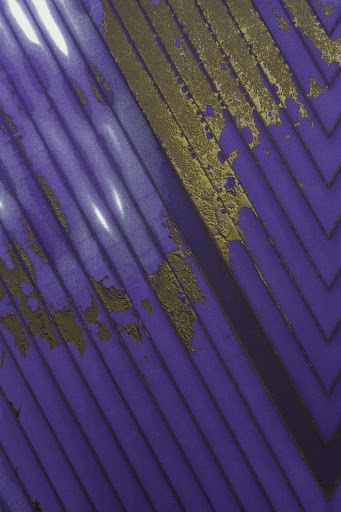 I use mostly industrial materials, where colour is either going to be covered over or simply doesn’t matter – like using a primer grey, white or brown – so the vibrant purple was an exciting option. I had been looking to use several of the inks that I use in my drawings, so Garvey was an obvious choice that did what I needed it to do, while also being this amazing colour. Garvey is an ink used in price-marking guns in supermarkets. It is also used in meat markets because it can be applied to frozen and shrink-wrapped meats, something that can’t be done with other inks. Garvey stains surfaces more than it covers them. It buries itself deep into surfaces, making it nearly impossible to erase or cover. It will eat through layers and layers of paint, and it’s basically indelible. The process is simple enough. I stretched a sheet of gessoed canvas over a set of stretcher bars, and then I stretched a sheet of raw canvas over that sheet of gessoed canvas so that there were two layers of canvas on top of one another. On the surface of the raw canvas, I applied a vinyl stencil, and on top of the stencil I inundated the surface with the Garvey using a foam brush and a lot of pouring of the ink. I had attempted these works without a stencil, but I have always been interested in what occurs when a pattern fails. My earlier paintings that incorporate tape address the failure of the tape’s ability to retain a constant edge. Through that failure, marks are generated and the pattern becomes distorted and abstract. I wanted that to happen with these works as well. There had to be a grid for this kind of process to operate on. Stencilling, its failure, and the process of using a stencil are interesting because there is a reduction that occurs. The majority of the Garvey poured onto these canvases was ultimately removed along with the stencil. In addressing gesture in these and other works, I am also revealing a certain anxiety I feel towards it as a painter. The incorporation of a painterly gesture in my work is either masked or arrived at through a complex process. The act of painting my paintings is physical. I move a lot, I work fast and slow. The evidence of this physicality is reflected in areas of the paintings where there is more or less of a mark, but the direct gesture exists only in traces that have been recorded through certain failures. The majority of a work has been torn off and thrown away. Vinyl is a material from the commercial signage industry. I was looking at materials in urban spaces, communicating and using language. I worked for a sign maker when I first moved to NYC, so I was aware of the use of vinyl in the production of signs. All these materials end up in the same space, in cities, outside, conveying information. This kind of leads into the vinyl works. I use vinyl in almost all my paintings, as either a stencilling mechanism or a primary material. I was working directly on gallery walls with the vinyl at first, something I hope to return to and a process that several of my artist friends work with now as well. The use of vinyl on gallery walls was interesting because the material was prepared for a specific site, the work was executed on site, and at the end of the exhibition it was ripped down and thrown away. It felt like a violation of the gallery space in a way. It was a use of real estate that simply could not be sold; it was a resistance to the economic function of a piece of architecture. I began putting the vinyl onto portable surfaces that kind of look like paintings because after several destroyed works of art I wanted some to survive, and I also wanted to look at them more critically as paintings rather than an installation art tactic. The vinyl works also have to do with pattern, distortion, layering and gesture. I create the simple stripe pattern on the computer and cut two of the same files on my vinyl plotter. I lay down each vinyl file as a large sheet onto the aluminium or whatever surface it may be, and as it is adhering to the surface, I create kinks, bends and tears in the sheet. These kinks replicate an idea of gesture for me. 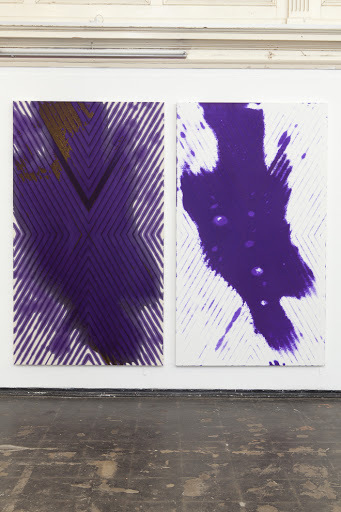 They are strikes or marks across the surface of a pattern, similar to a brushstroke, but arrived at in a pattern that invokes digital files, industrial processes, and ultimately a failure in application. The kinks were arrived at after a mistake in adhering vinyl to a painting to be used as a stencil. 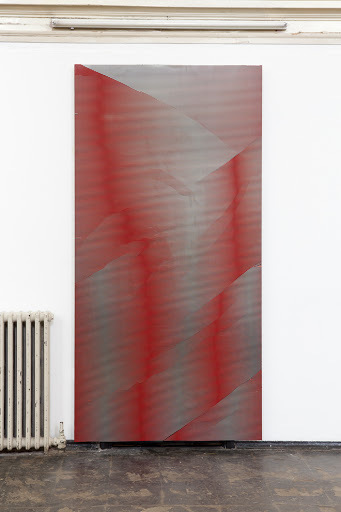 The two layers in the works – red and black vinyl – provoke ideas of depth and space, and they activate the surface in a way that a single layer cannot. That can look more like a mistake than anything. 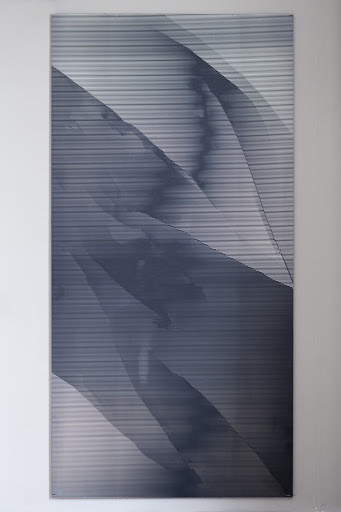 I am interested in a certain type of painting that rejects ideas of space as gradients. The two layers of patterning are just lines, but they kind of defy the notion of a ‘hard edge’. In both the Garvey and vinyl works, I have no idea how they will look until elements involved in the process are completed and then some parts removed. There is an element of chance in the work. EMDW: There’s an evident historical reference in the Garvey ink works to Frank Stella’s famous painting Die Fahne Hoch! (1959), which is viewed by many people as the precursor to Minimalism. Can you talk a bit about this and what that reference signifies for you? Also, how is that work’s meaning different in today’s political climate, compared with when Stella first made that work? NV: Die Fahne Hoch! has been my favourite painting since I was a teenager. Stella is also a local hero of mine; I’m from Boston not terribly far from where he is, so civic pride plays a role in my interest in that painting in particular. I was interested in the painting because of its use of symmetry, its boldness and also its use of enamel paint. It’s funny for me to discuss now. When I began painting I thought that a method of accessing the type of painting I wanted to be working in would be to paint my favourite painting. It turned into an obsession, a motif and eventually more of a template on which to enact certain painterly strategies. I think of it at this point more like being an appropriation, a sign to direct the viewer and let them know what they should be thinking about when viewing my painting. I always return to it no matter what, it helps me figure out how to make a painting. Stella was a celebrated young New York painter right out of an esteemed university when he made Die Fahne Hoch! His position of being a celebrated abstract painter with an impressive degree is familiar territory for artists working in New York at the moment. But painting now compared with when Stella made Die Fahne Hoch! is different. Paintings are props embedded within systems of communication and distribution. Contemporary painting either reflects an affinity for the past or acts as a conductor for some other meaning or action. Gesture is developed out of working quickly and efficiently. My aim is to cover as much space as possible as fast as possible, so there is a level of abandon in the application process that is not subconscious, spiritual or careless, but is evenly distributed with the hope of a quick and even coat. I paint alone in a small room wearing a large mask, gloves and a Tyvek suit that goes over my shoes. It’s ritualistic in a way, celebrating labour and touting protective gear as something of a fashion statement, albeit a private one. EMDW: Issues of representation are central to discourse around painting, and often the debate is centred on the binary of figurative/abstract. But it seems to me that in describing your works it might be more useful to use a concept or word like ‘concrete’ or ‘linear’ because the process of making is foregrounded to such an extent that it becomes the content of the work. Of course every work shows the process of its making to a certain extent, but with yours it seems so central. Do you think about your works in such terms, and if so what is your feeling regarding the classification of works as abstract or figurative, or even narrative? NV: Yeah, abstract is a label that I find interesting. I make target paintings and I find the word target, used in the 60s to describe circular works with concentric circles painted on them, to be an interesting label for an abstract painting. It’s an abstract object, using a relative and literal term as a title or description. It seems contradictory. It’s like Josh Smith’s name paintings, which exist in a really ambiguous grey area between abstraction and representation. In any event, much of my work is the successful result of a series of steps. It almost seems more like an orchestration of elements to create a ‘mistake’ with a very small margin of error. For me, as I develop a process, I make very bad versions of the works that I eventually end up showing in exhibitions. I narrow the process down to where the work looks the way I want it to look, note the steps I took, and then execute a series of them. The Garvey paintings were incredibly difficult for me to figure out. I went through almost 30 canvases trying to get it right. (All those tests were destroyed in Hurricane Sandy by the way!) This research and development and the resulting honed and mostly figured out painting kind of defy the type of decision-making or chance that may be associated with abstract painting. I see abstract painting as visual language, like a conversation the artist is having with the canvas, where decisions are evident and execution is important. I kind of eradicate those decisions in my paintings and just create examples of something that I think works. I don’t know if abstract is a proper way of thinking about it, however there seems to be an increasing trend in ‘abstract painting’. The Garvey canvases were a way of addressing content for me. I had this anxiety about making the same painting over and over again, under the idea that it was serial work or some other art term. For me it began to feel like stagnation and cooperation with some sort of market demand for a type of painting. This threatened to monopolise my production and output and I was afraid of that. Instead of rejecting it, I attempted to embrace this idea of production and repetition through some clues that I access while drawing. I thought about the idea of making the same painting over and over again with a single work, or a single gesture. Those paintings attempted to address the factory-like production of so-called abstract paintings with their honoured gestures and unique marks. I wanted the marks to be repeated, if distorted between the two works. 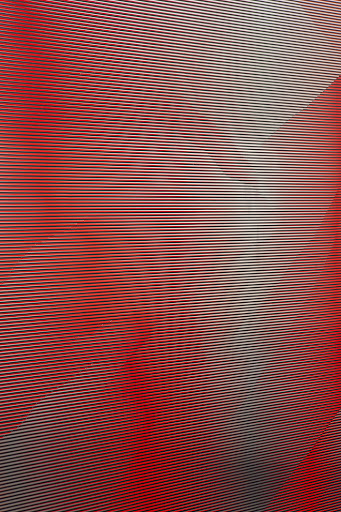 Many artists are concerned with this type of production, and it felt to me that it could be approached in a method that reflected its production while also being the result of something non-digital or mechanised, a mark created by a hand on one surface that renders two results.This interview was originally published in Painting from the Zabludowicz Collection, available here. This entry was posted on July 16, 2013 by ellendw.